Poetrybird has been performing rude, smutty and comical poems for many years. 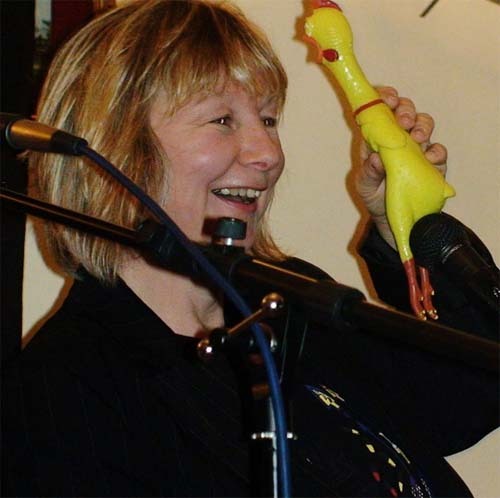 Her poems are based on real life, pets, relationships and also relate to her work as a medical secretary in general surgery at a large NHS hospital, where you would not believe some of the items that had to be surgically removed! Poetrybird did her own show at Edinburgh Festival in 2001. Veteran of the famous Tunnel Club in the 1980’s, a regular on Stand Up L!ve for L!ve TV cable television in the 90’s and also performs as part of double act Office Girls Go Crazy. Poetrybird was a regular performer at Rrrants Spoken Word & Comedy in Camden in 2013/14 and she has performed at many comedy/poetry clubs in the London area as well as in Brighton, Dublin and Edinburgh. She has also performed on the Wibbly Wobbly Boat in Rotherhithe as the comedy spot on band nights, open mics at Up The Creek and a very successful open spot for Mirth Control in London earlier this year. Poetrybird has made a huge impact with her comedy poetry and is guaranteed to raise huge laughs and applause everywhere she performs. She was runner up in Zoo Idol at Edinburgh Festival in 2008. This year, at the last minute, she entered a heat of the Hammer & Tongue Slam Poetry Competition at the Edinburgh Festival against stiff competition and won! She now goes forward to the National Slam Finals at the Royal Albert Hall in January 2016. “she is just what I wanted Pam Ayres to be like when I was younger” - Steve Larkin, Hammer & Tongue compere Edinburgh 2015.